I feel like I keep searching and continually come up empty in my quest for the right shoes for my wedding, so I'm hoping you and your readers can help get me on track! This is my dress [pictured above] and I'm wearing gold jewelry, so I'm thinking of wearing a gold or cream colored sandal at my wedding in October. Sounds simple, right? There are a couple of things that have made it more difficult to find the right one. >>I really want a shoe with a low-ish heel - and preferably a wedge - since I'm crazy clumsy and therefore terrible in heels. This rules out a lot of options. >>Finding the right tone of gold - I don't want anything too shiny, but more of a matte or distressed look - or the right shade of cream - one that works with the dress - has been hard. >>Finally, the kicker is that I've got enormous feet. I wear a size 11, and it's crazy hard to find good shoes in that size anyway, let alone something so specific. Help! I'm sure there are resources I'm not looking at that would be good to investigate. I'd love to spend no more than $200 on these guys. Have I not told you all to just check Loeffler Randall before you pester me with shoe questions?? I won't even bother shopping, cause ESB nailed it. Right?! And I was really looking forward to a shoe challenge! @Heather coding one for tomorrow! i won't even shop i'll just throw it out there. was JUST going to say this. amazing shoes. SO these say beige but look cream to me and more importantly they are super cute the height is reasonable and only $69! Also these are definitely beige, but have a gold accent. And then I stumbled across these fancy shoes. they are gold... so if you want to go with the animal toe look you can. Just giving you all the options. THE FIRST ONES. are perfect. Animal toe does not mean what I expected it to mean. Sp those are bitchin' shoes, but if your onsessing about a precise colour you can always buy a pair from http://www.dyeableshoestore.com/ and then have then dyed. For once, I'm glad that a comment link is long & non-clickable. Perfect, perfect, perfect. Like your hipster teen cousin will be jealous and your great aunt will still approve. Fine choice. But I have to tag this one as LAZYPANTSES, 'cause LR is, like, WAY TOO EASY. I assume you don't want a cork heel on your wedge? If you're ok with that then there are more options. OooOoOooo, those Aerins. I'm a sucker for gold plates. Oh LR, why are you too perfect sometimes? Good work ESB. This is what I thought of too. Whoa, I almost bought this for my wedding dress! 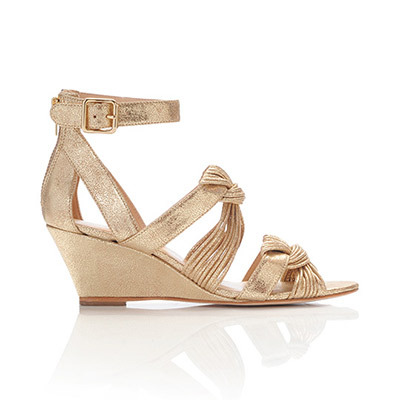 I bought these Marc Jacobs wedges that are super low for after my ceremony (I'm super short, way shorter than my fiance, so I want to be tall for at least the ceremony when we're standing next to each other and then have flatter shoes after) http://www.saksfifthavenue.com/main/ProductDetail.jsp?PRODUCT%3C%3Eprd_id=845524446541870&CAWELAID=1648906097&cagpspn=pla&site_refer=GGLPRADS001 I am too lazy to go find who has them in stock, but they're a style he makes over and over so the chances of finding them may be good?? When you can't forget the gifts you didn't get. What do I wear to a wedding in TOFINO? WHAT'S IN YOUR BAG? Dude edition. SeaVees + Teva at BARNEYS? WHAT'S IN YOUR BAG? Wyoming edition!